in the United States Code (USC) that is. Provisions relating to voting and elections are being transferred from titles 2 (Congress) and 42 (Public Health and Welfare) into a new Title 52, Voting and Elections. The transfers are necessary and desirable to create a well organized, coherent structure for this body of law and to improve the overall organization of the USC. No statutory text is altered. The provisions are merely being relocated from one place to another in the Code. In 1926, when the organizational structure of the USC was initially established, no separate title for voting and elections was created. At that time, only two federal statutory provisions relating to voting and elections were in existence. Since 1960, an extensive body of federal statutory law relating to voting and elections has been enacted, including title III of the Civil Rights Act of 1960, the Voting Rights Act of 1965, the Federal Election Campaign Act of 1971, the Voting Accessibility for the Elderly and Handicapped Act, the Uniformed and Overseas Citizens Absentee Voting Act, the National Voter Registration Act of 1993, and the Help America Vote Act of 2002. Upon enactment, each of these laws was incorporated into the existing structure of the Code in the most logical manner possible. However, as this body of law has grown and evolved, it has become increasingly apparent that a separate title is needed. Title 52, Voting and Elections, provides a well organized, coherent structure for this important body of law while simplifying the structure of titles 2 and 42. 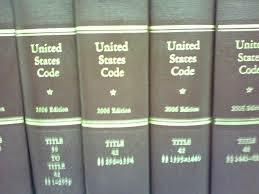 For the online version of the United States Code, the transfers will occur on September 1, 2014, after which the new Code citations should be used. For the printed version of the Code, the transfers will occur effective with supplement II of the 2012 edition.